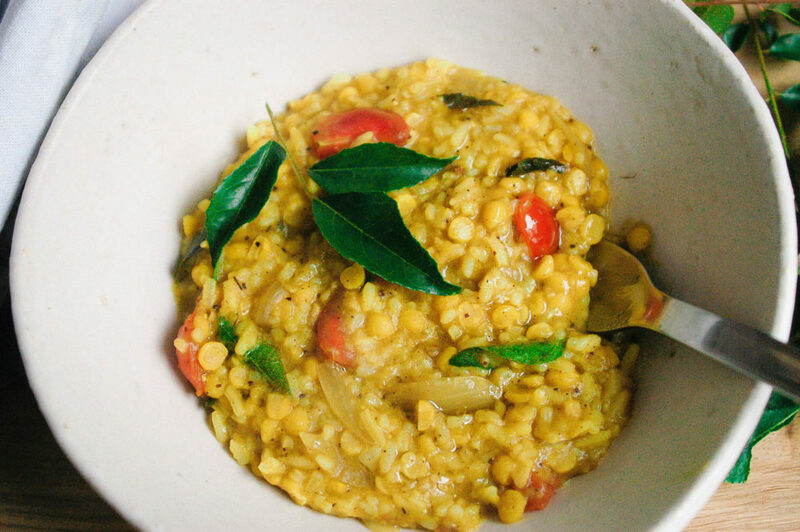 In India and other Southern Asian countries, this delicious dish, pronounced ‘kich-ah-ree’ is renowned for it’s healing and restorative properties thanks both to it’s combination of rice and split peas and also it’s many spices, especially turmeric which has been found to reduce inflammation. 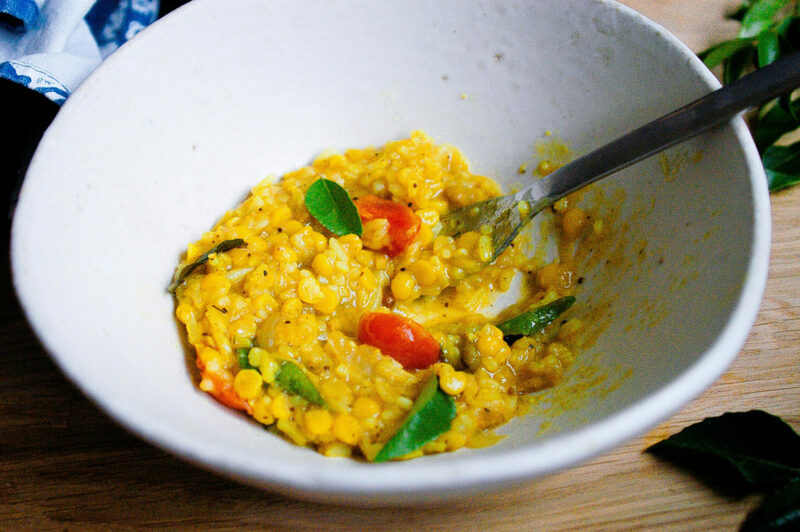 Interestingly, combining tumeric with black pepper strengthens its anti-inflammatory properties, so the frequent pairing of the two in dishes is no coincidence; nature, so clever…. Split peas, like lentils, are a good source of protein, while basmati is a low GI rice, meaning it keeps you fuller for longer. All together this amounts to one very hearty, filling dish which also provides some very welcome, long lasting energy. 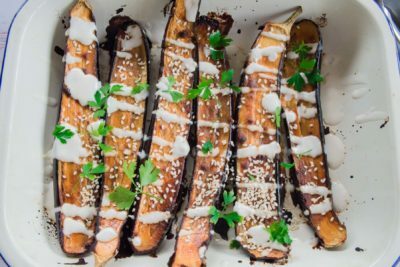 It’s a meal on its own but also goes really well with pan fried eggplant or fish. Heat oil in a large saucepan over medium heat. Add onion and fry until soft. Add garlic, ginger, tomato, curry leaves and spices and fry for another minute. Add split peas, rice, salt and pepper and 4 cups water and simmer for 30-40 minutes until rice and peas are tender, adding more water if necessary. 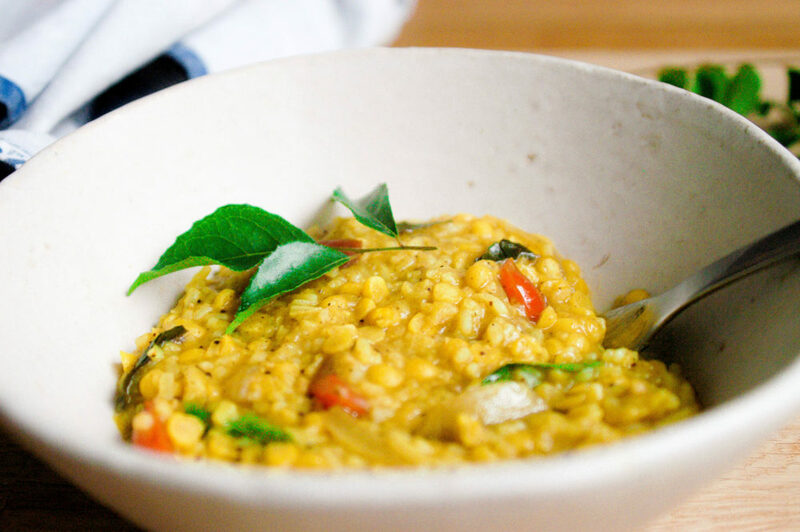 Serve garnished with extra curry leaves or chopped coriander.